That report was on January 21. For details, see the IMF's World Economic Outlook Update, January 2019. 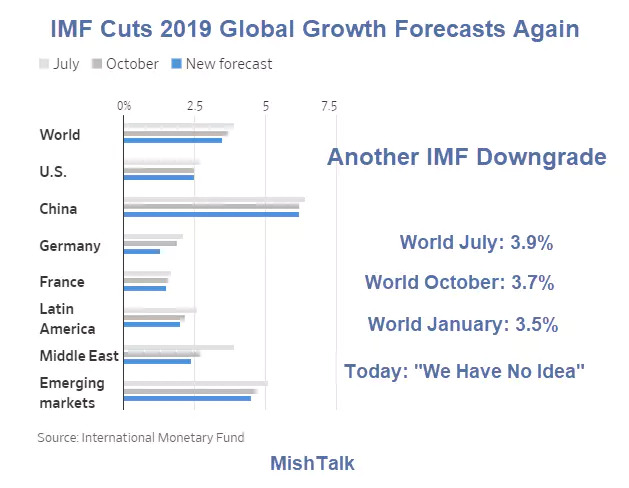 Please consider IMF Warns of Global Economic "Storm" as Growth Undershoots. Lagarde said trade tensions -- mainly in the shape of a tariff spat between the United States and China, the world's two biggest economies -- are already having a global impact. It's refreshing to hear Lagarde say "we have no idea". The IMF should say that every month.